Billy Crudup (right) delivers a strong performance in William H. Macy's flawed directorial debut. With his feature directing debut, you certainly can't say William H. Macy played it safe with Rudderless. The film tries to turn a tragic mass shooting on a college campus into a redemption story about the healing power of music and human connection. And while Macy succeeds in that ambition effectively for long stretches, the movie is ultimately underwhelmed by some tone-deaf non sequiturs and unneeded tangents. Billy Crudup stars as Sam, a successful executive whose son Josh is killed early on, sending Sam on a drinking binge that lands him, two years later, living alone on a boat and painting houses for a living. Sam's ex-wife Emily (Felicity Huffman) shows up one day with boxes full of Josh's belongings — including notebooks and CDs full of songs Josh was writing when he died. Inspired by what he reads and hears, Sam learns Josh's songs on an old acoustic guitar, finding some joy in connecting with his son's music. The songs pull Sam out of his depression, even inspiring him to take the stage at a local bar for open mic night. That's where Sam meets Quentin (Anton Yelchin), a socially awkward young musician who likes Sam's performance so much that he stalks him for days until he agrees to start a band. Suddenly surrounded by three young and remarkably capable musicians, Josh's songs turn from quiet acoustic musings into catchy pop-rock tunes that attract a rabid following in no time. Quentin is happy to be in a band that actually has fans, and Sam is finding himself again through his new young friend — although he keeps the origin of his songs a secret for a reason the audience is left to guess. That decision will, naturally, come to haunt Sam later as a major twist changes what was to that point a relatively sweet, straightforward story of a man connecting with a stand-in for his dead son into something else entirely. That's unfortunate, because the chemistry between Crudup and Yelchin is genuinely engaging and moving. 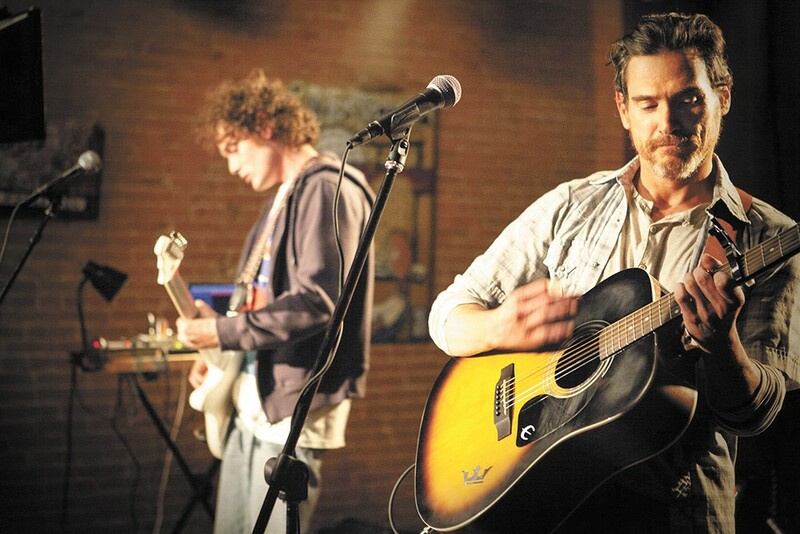 If Rudderless had kept it simple and stuck to their relationship, it would ultimately have been successful. Instead, the film is undermined by some distracting choices made by Macy. And I mean DISTRACTING. One example is a Caddyshack homage that comes out of nowhere, aiming for laughs in a movie doing fine without slapstick. Another is Selena Gomez as the dead son's girlfriend, an obvious publicity stunt more than thoughtful casting choice.